HMRC has revealed some of the most ‘bizarre excuses’ taxpayers have given for failing to file their self-assessment tax return on time. Excuses included ‘I’m too short to reach the post box’, and ‘my boiler had broken and my fingers were too cold to type’. One taxpayer claimed that a junior member of staff ‘forgot to wear their glasses’, and accidentally registered a client for self-assessment. 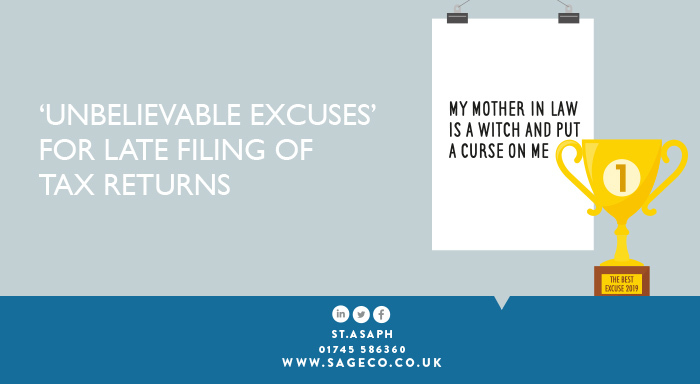 Another told HMRC that their mother-in-law was a witch and that she had put a curse on the taxpayer, which prevented them from filing their tax return on time. In addition to these excuses, HMRC also stated that every year, they receive some unconvincing expenses claims.